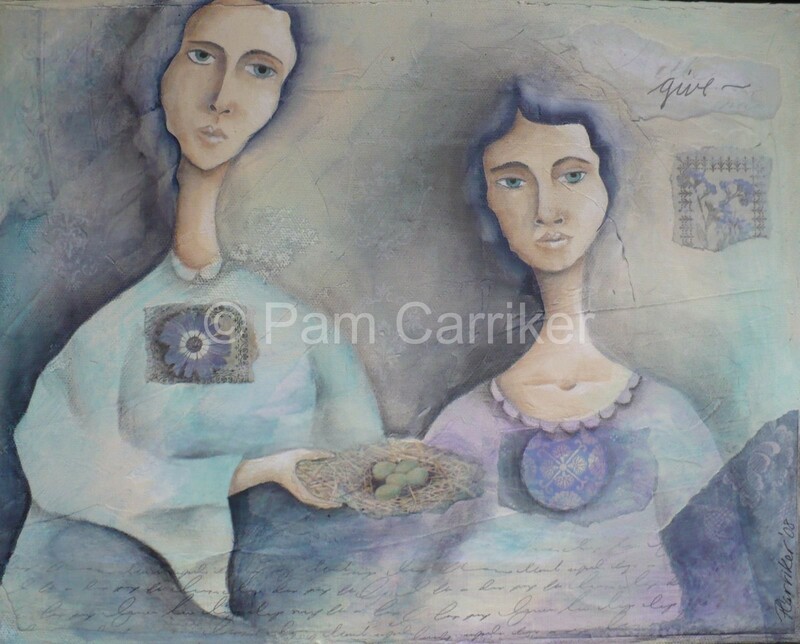 I just finished this piece with the simple title of ‘Give‘. As women, we give of ourselves daily in the most mundane ways. We give to our children as we perform the daily activities of living, making sure they have clean clothes, good food, and a loving home. We give to our husbands by giving support, encouragement and love. As artists we give to our fellow artists as we share our passion and inspiration. We support each other in our artistic pursuits and share our discoveries as we journey. Each work is a step on the path to discovering ourselves. What is important to us, what moves us, what inspires us. I know we all work in different ways, I rarely plan out a piece. I sometimes will work from a rough sketch, but the words almost always come last. I let the piece tell me what it wants to say. The faces are drawn right to canvas, using the same basic techniques, but always each has a different face. this is becoming more evident as I am incorporating more than one face in some of my recent works. How does this happen? I don’t know, but love that it does. I feel like each one is her own person. Sometimes we need just a simple, one word reminder of the things that are important. So remember to ‘give’ today, and remind yourself of the many daily things you do that are giving.